31 Aug 1957. The same year Malaysia achieved its Merdeka from the British, Ghana became the first African state to gain its Independence*. A year earlier, Sudan, Morocco and Tunisia got their Independence** and in 1958 it was Guinea's turn to be freed of colonialism. In 1960, the year we turned 3 years old, Cameroon, Senegal, Togo, Rep of Congo, Somalia, Madagascar, Benin, Niger, Bukina Faso, Cote d'Ivorie, Chad, Central African Republic, Dem Republic of Congo, Gabon, Cyprus, Mali, Nigeria and Mauritania became Independent nations. Selamat Hari Merdeka. May we forge stronger ahead despite our petty "wars" and may our children live happily ever after us. ** Sudan, Morocco and Tunisia all gained independence the year before from their French masters. apa you duk kena paksa buat sekarang kalo tak Merdeka? Satu lagi duk tak habis2 kena kayuh beca roda tiga. My grandfather once told me- when comparing yourself against another - always do it against someone who has done better than you. the true historical fact is that only Malaya (Tanah Melayu) gained independence on 31st August 1957. When the late Tunku Abdul Rahman shouted "MERDEKA, MERDEKA, MERDEKA" on that historic date, 54 years ago at the Merdeka Stadium in Kuala Lumpur, people in Sabah and Sarawak were still under British rule. So that is why 16th September 1863 is still very much significant in the hearts of Sabahans and Sarawakians till this day. 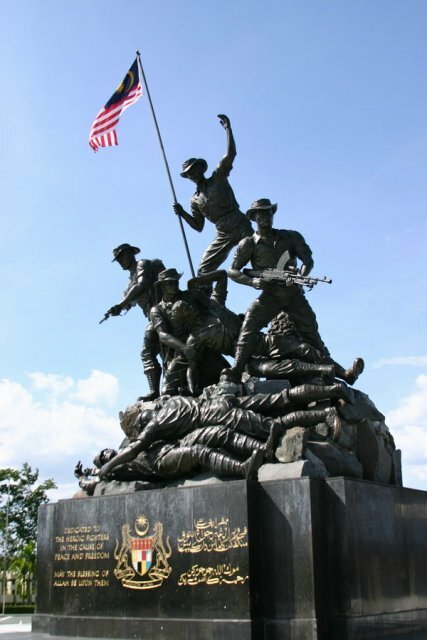 Nevertheless we still celebrate Merdeka Day which falls on 31st August every year. Can we say Malaysia actually has got 2 independent days, that is 31 Aug and 16 September??? Interestingly, Ghana was the model country we followed for infrastructures, like hospitals, dam & highways. Our federal highway between KL & Klang was based on their highway between their capital Accra and port city Tema. And all those still remain as it was, while we have moved on like 30 or 40 years ahead. kah kah kah. sure, we are doing BRTTER than Sudan and Somalia. aduyaaaaiii....! "...Ghana became the first African state to gain its Indepedence. A year earlier, Sudan, Morocco and Tunisia got their Independence ..."
Errrr. Latok. Aren't Sudan, Morocco and Tunisia in Africa too? Sure, any "one" can say we are not doing badly at all when it comes to talking about the nation's "progress". Yet as always just like any progressive person would analyse himself or herself from time to time, there is surely the vital factor of "opportunity cost" which in economics would mean what am i willing to forgo by taking this path instead of that other path (which may turn out to be even more progressive ultimately). So generally, its easy to say "not so bad" as compared to maybe others but sometimes it may be to the extent of "continually fooling ourselfs and some" with excuses/own analysis; especially if there are better comparisons possible with those already way up in the progess charts who did better homework previously and today are already there and more progressive WHOLESOMELY. Happy National Day Malaysia 2011. Ada baik juga kita compare dengan orang yang kurang bernasib baik dari kita, kita akan lebih tenang dan bersyukur. Kalau kita asyik banding dengan orang yang lebih dari kita, kita mungkin akan termotivasi seketika, tetapi lebih banyak merungut sebenarnya akan timbul seperti yang terjadi pada orang PR sekarang ini. Lagipun bersyukur sambil berusaha kan lebih baik. Ghana was also known as the Gold Coast. 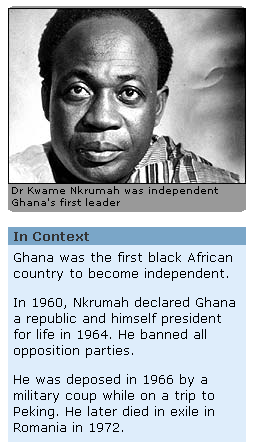 Ghana was the first black African country to become independent. In 1960, Nkrumah declared Ghana a republic and himself president for life in 1964. He banned all opposition parties. He was deposed in 1966 by a military coup while on a trip to Peking. He later died in exile in Romania in 1972. There followed a period of unstable government with one coup after another, culminating in 1992 in a referendum on a multiparty system. Flight Lieutenant Jerry Rawlings, who had already led two coups against the government, was elected president. His supporters credit him with stabilising a turbulent political scene and leaving a legacy of democracy. He retired in 2000 and President John Kufuor was elected. Your grandfather's right. We should always look up and to someone better whenever we want to forge ahead. But I'm sure your grandfather also told you that if you think you are doing badly, think! there are many others who are worse off than you are. so don't wallow in your pathetic self pity and be thankful that Tun Abdul Razak did not declare himself PM for Life under Mageran or that Mahathir was the great dictator that stepped down after 22 years as PM, probably the only dictator in the world that decided to resign ..
Btw, are you asking us to look up North Korea? bebek, I'm sure you must have meant '1963' instead of '1863'. Today is 31st August 2011. People everywhere in this country are reveling in a festive mood because today marks the day when Malaysia, or rather Malaya, gained her independence from British Empire in 1957. Correction, not everybody is in happy mood. People in Sabah and Sarawak see this date as a big fail. Mr Rocky Bru, thanks for the reply... you are one great journalist/writer.. i would say, you are among the best in Asia. Sorry for the typing error, should have been 1963.. not 1863 (4D punters, what are you waiting for?? hehe).. Anyway...Cheers... Happy Merdeka..
By the way, i heard when you first assumed office at the Malay Mail, you told your staff to start blogging and also telling them that they can wear Jeans to work as long as it is not official function.. Have they followed your "instruction"?? 1st black african nation? sudan is not considered black? Ai yo yo!!?? Rocky so much mis/wrong facts here??? Errr pardon my ilmu alam and matapelajaran lukisan, but is there a "white African country"? talking about comparing against somebody better than you. Indeed, your grandpa is the wise one. Why not take a kindergarten kid and compare it against a university graduate? damn how thankful i am we're not ghana. using your logic rocky, south koreans should be damn thankful they're not malaysia! As far as African nations are concerned, there are Negroid-dominant nations all in sub-Saharan region (i.e. in the southern side of the Sahel biogeographic zone and could include the Sahel zone itself) and Semitic-dominant nations in the northern side of the biogeographic zone plus Ethiopia and Eritrea. And when I say Semitic, I'm refering to Arab and Ethiopian/Eritrean ethnicities. Of course there's no such thing like "white African nation" since there has never been a single white-majority country in Africa. I believe when the author writes "black African nation" he does never mean that there are "white African nations". He says "black African" to differentiate from Arab/Semitic African nations, a few of which have granted independence before Ghana (eg. Egypt, Morocco etc.) and Ethiopia which have never been officially colonized by European powers. In fact, the pre-partition Sudan was a multi-ethnic nation with a slight Arab majority and numerous non-Arab tribes making a significant minority, most of which having gone with the creation of South Sudan, leaving the remaining (North) Sudan even more overwhelmingly Arab as of today. Statistics for National Gross Debt mana? Anak cucu kita semua dah jadi hamba hutang negara... Merdeka apa namanya? Compare Malaysia to Singapore lah. We are 150% behind/negative when comparing our money value.ie RM 2.5 = S$1.0. 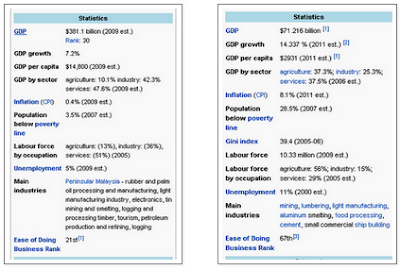 That means Malaysian gomen is 150% less efficient or stupider that the Singapore gomen. Kah,kah,kah. Bodoh punya Latuk, mau bodek kerajaan yang bodoh. Kah,kah,kah. Gue sakit pelut. Mau belak. Itu Pak Yeh sulah pantat(screw) lu kau kau lo.